On the other side, Harrah’s put up the whole $2 million prize pool, and they felt like they should be able to have a few spots available for exemptions. Also, with Chan and Brunson having a record 10 victories apiece at the WSOP — I am alone in second with nine — Harrah’s felt like we were “Champions,” and this was, after all, the TOC. Amazingly, with 12 players left, the three of us were still in the hunt. 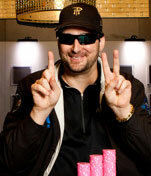 Also in the final 12 were Mike “the Mouth” Matusow, “Cowboy” Hoyt Corkins, and European star Tony Bloom, to name a few. With nine players being paid and $1 million for first, the heat was on! Chan finished 12th as he was a short stack, and Brunson came to the final 10-handed table, but with only $5,700 in chips, whereas I had the chip lead with $281,000 in chips. On the second hand of the final table, with the blinds at $1,000-$2,000 — and a $200 a player ante — Brunson was in the big blind. Matusow suddenly announced to the table that Brunson was going all-in no matter what his cards were, as Matusow couldn’t see how Brunson could fold any hand with $2,200 of his $5,700 already committed to the pot. Indeed, I believe that it would have been tough for Brunson to fold any two cards here, as he would have left himself in an almost untenable position — surely it would have been tough to come back from $3,500, with $1,000 in the small blind, and $200 put up as an ante. In any case, a player raised it up with his J-J, and Brunson had Ah-3h in the big blind, which made his all-in call all but academic. With the cards on their backs, it was announced to the huge audience that Brunson’s Ah-3h was a 2-1/2-to-1 underdog to win vs. J-J. It seemed like the whole room was rooting for the legendary, 71-year-old Brunson, as they shouting, “Ace, ace, ace!” The flop was K-3-2, with no hearts, and now Brunson needed an ace or a three, or running straight cards like 5-4. Of course, at this point the whole room was screaming, “Ace or three, ace or three, ace or three!” The turn card was a deuce, and now Brunson needed an ace or a three on the last card. Thus he had two threes, and three aces, for “five outs” total. With 44 cards remaining, he was a now a 39-to-5 underdog, or about eight-to-one underdog. Alas, the last card was a nine, and now the final table was set. On the good side of the coin, I was the chip leader. After a second-place finish in the TOC in 2004 — to Annie Duke — I had a chance to come back and win the TOC in 2005!